Install this amazing material in your home today! 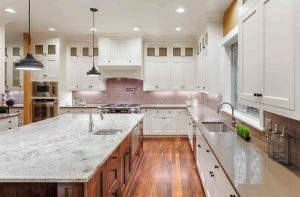 When cooking in your kitchen, you want countertops that are reliable and resistant to any potential accidents you might make. It is important to pick a material for your countertops that is both stylish and durable. Quartz has gained popularity in the last 20 years and is an alternative option to other natural stones, such as marble and granite. Quartz is manufactured and mixed with binders like resin making it a more attractive product than of the other options on the market. An important factor of any item in your home is that it is beautiful and integrates seamlessly with the rest of your home. Quartz, although man-made, has a three-dimensional appearance and depth mimicking the style of natural stone. The material comes in a wide selection of colors that will be sure to please every member of your household. So you can choose a classic color like white or be more adventurous and go for an edgy blue. Although it is as durable as concrete and granite, quartz is much more forgiving, so it will not crack or chip if put under pressure during cooking. The strength of quartz makes it a low maintenance material, so you will never have to worry about repairing your countertops. Installing quartz into your home is made simple because it is predictable to work with and produces very little waste. Quartz is a non-porous material, so it will resist staining compared to other material such as granite and marble. It is the perfect material to install in your kitchen because it is resistant to common food stains such as juices and cooking oils. So, after dinner clean up will be made simple with quartz countertops. The material will not harbor any bacteria or virus because of its non-porous nature making it a sanitary option for your family. These benefits of quartz make it, so you will rarely have to reseal it. This entry was posted on Friday, August 4th, 2017 at 2:58 pm. Both comments and pings are currently closed.